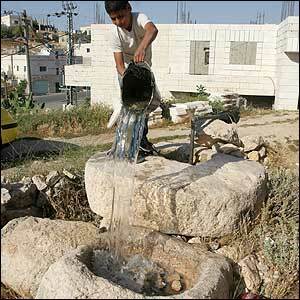 A Green Prophet Finds West Bank In Water Crisis Too! Israel’s water crisis has been in the news a lot lately. We have all heard how low the Kinneret (the Sea of Galilee) is, and seen suggestions on how to save water this summer. Although it receives much less media coverage, water scarcity has also become a major issue in the Palestinian Territories. This past week I visited Auja, a Palestinian community of 4,500 located 12 kilometers outside of Jericho in the West Bank. In the mayor’s office, we met three farmers whose frustration was visible. They explained that the nearby Jewish settlements tap into Ein Auja, their village’s traditional source of water, leaving little leftover for Auja’s citizens to irrigate their crops. In the last twenty years the community’s agricultural productivity has shrunk from tens of thousands of dunams to just 600, and their unemployment rate has skyrocketed because the majority of Auja’s citizens are farmers. Unfortunately, Auja’s situation is not unique. Earlier this month, the Israeli human rights organization B’tselem published a report detailing the acute water scarcity in the West Bank, and attributing it to both drought and to Israeli policy. The report indicates that Israel maintains control over joint water resources, and forbids Palestinians from drilling into water sources without Israeli military approval. In addition to the drought conditions that are exacerbating water scarcity throughout the region, this situation makes it very difficult for Palestinians to meet their water needs. The Palestinian Water Authority reports there is a water shortage of 40 to 70 million cubic meters, even though Palestinian per capita water consumption is 66 liters, only two thirds of what the World Health Organization recommends as the basic minimum necessary for health and sanitation. For related prophecies on the West Bank and water, check out Israel’s Water Levels Go From Red to Black or Why is the Society for the Protection of Nature Supporting Settlements in the West Bank? Thhis website really has all the info I wanted aboyt this subjet andd didn’t know who to ask.